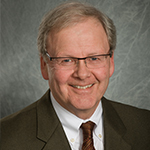 Jay Vroom has served as president and chief executive officer of the trade association known as CropLife America (CLA) since 1989. Vroom is a founding member of the CropLife Foundation, serving as chairman since its inception in 2001 and, since 2015, also serves as the Foundation’s Vice-Chair. His also sits on the Board of Directors for the Agricultural Retailers Association, Asmark, National Wheat Foundation, the National Association of Manufacturers Council of Manufacturing Associations, and the Soil Health Institute. He is also a member of the Farm Foundation Roundtable Steering Committee, and the North American Climate Smart Ag Alliance Steering Committee. Prior to joining the CropLife staff, Vroom held various positions in executive capacities with the National Fertilizer Solutions Association (now the Ag Retailers Association), the Merchants Exchange of St. Louis and The Fertilizer Institute. He graduated with honors from the College of Agriculture, Consumer and Environmental Sciences at the University of Illinois Urbana-Champaign. Vroom was raised on a grain and livestock farm in north-central Illinois and continues to own the farming operation.